In the previous chapter, you learned about Sass and its transpiler. Here, you will learn to set up development environment for Sass. The Sass transpiler uses Ruby, which isn't installed by default in Windows, so that's the first thing we need to do. 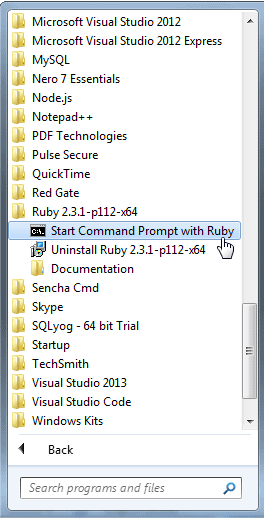 Use the above command prompt with ruby to run all the commands for sass. On Windows, you might get a confirmation dialog. Just say yes. After a moment or two, you should see the version of Sass installed on your system (that's what the -v switch means). Enter the following code, and save the file. Congratulations! You've just written your first piece of Sass code and transpiled it into CSS. But that can get tedious fast. The chances are good that whatever code editor you use will handle the transpilation process for you, either natively or via an editor extension. Extensions are available for most of the popular editors, including Visual Studio Code and Atom. It's worth checking out, because integrated transpilation makes the whole process seamless. If you use any workflow automation tool such as Grunt or Gulp, you can include the transpilation process in your task file. Again, it makes the process seamless, and the fewer things you need to think about when you're coding, the better, right? Any of these techniques will work for the examples and exercises in this tutorial, but for the sake of simplicity, we'll use the most basic: the command line. The installation process is a little different depending on whether you're using Windows or a Mac, but once Sass is installed, everything will work the same, whatever editor or operating system you're using. where project/sass is of course wherever you're putting your Sass files during development and project/stylesheets is wherever you're putting your CSS files for deployment. Most of the time all you'll need Sass to do is transpile a file or a folder of files, but it does have some other switches. You can check them out by typing sass --help at the command line.